Why should you read the terms and conditions? By failing to review the terms and conditions you may be giving up certain rights, and you probably won’t find out until something goes drastically wrong. Terms and Conditions. Read the Fine Print. Let’s take, for example, Blink, Inc. This company offers their client’s instant photo shoots from family portraits and profile pics to website, catalogue, and advertising. While Blink, Inc. may have a great concept that many people are drawn to, the company’s terms and conditions should be reviewed carefully and understood completely. By using the Company Properties, you acknowledge and agree that Blink Inc owns all right, title, and interest in any photos (“Blinks”) taken by use of the Services, including all intellectual property and proprietary rights therein. You hereby assign to Blink Inc all right, title, and interest to the Blinks (including all intellectual property and proprietary rights therein), and you hereby waive all moral rights, privacy rights, publicity rights, artist’s rights, rights of integrity, rights of attribution, and all other rights you may have in or related to any of the Blinks (including rights associated with your likeness or image appearing in such Blinks). So, while you may believe that you own the rights to the photos taken of you, your family members or pets, this agreement says in a roundabout way that you don’t. This is why it’s imperative to read and understand all agreements before you accept them. 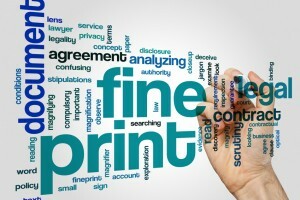 And if you’re overwhelmed by these types of legal agreements, an attorney can always help you navigate through the fine print. Uber. Contract. Terms of Service.